Posted by Carolyn Burns Bass in Books Are Great Gifts. We had a night of surprises during our inaugural BOOKS ARE GREAT GIFTS auction of signed books last Friday. Thanks to our kind-hearted authors who donated books and the enthusiastic bidders who bought them, we raised $1300 in book sales, plus two individuals gave additional donations that brought the evening’s total to $1360 for our literacy charity The Reading Tree. Having worked with authors for several years, and knowing their unstinting generosity, the auction’s success probably shouldn’t have been such a surprise. What truly overwhelmed us was how so many of the authors who donated books were right there bidding and buying the books of their fellow authors. Twitter had been hacked earlier in the day by a cyber terrorist group that shall not be named, creating havoc and dropped tweets late into the night. With the help of many auction supporters who RT’d dropped tweets, we managed to see all of the bids and bring them into action. The bidding got hot as the night wore on, so much so that the next surprise was learning that each Twitter account is allowed only a certain amount of status updates per hour. LitChat’s account went bankrupt. #BAGG auctioneer and LitChat founder hopped over to her personal account (@CarolyBurnsBass) and continued the action. Enthusiasm from authors and bidders grew as the night wore on. Several other authors noted the activity and saw the charity benefit and asked if they could throw in one of their books. How could we refuse? With an already diverse list of superb books on the block we added five spontaneous auctions, including the night’s stellar seller (The Bullfighter Checks Her Makeup) from Susan Orlean (@SusanOrlean) whose hilarious crowing for her book (plus a signed photo of her famous rooster, Laura) drew in a sale of $290 (with two additional cash donors on the side). Julie Klam (@JulieKlam) tossed in a hot title and ignited a bidding war with a spontaneous donation of her memoir Please Excuse My Daughter, which closed at $125. Other extra book donations came from Kristin Bair O’Keeffe, whose debut novel, Thirsty, launched in October; Elyssa East, author of Dogtown, a true crime narrative released earlier this month, and Maggie Dana (@MaggieDana) a #litchat regular whose debut novel Beachcombing released in the UK has just been long listed for the Romantic Novel of the Year award. The complete auction catalog (sans spontaneous extras) can be downloaded here. Many bidders and donating authors stuck with us through the whole auction, while others popped in and out. What was originally planned as a four-hour auction from 6 to 10 p.m. EST stretched into seven hours, closing at 1 a.m. EST with the sale of Orlean’s The Bullfighter Checks Her Makeup. Each of the winners of our two $25 giftcards from BookSwim that we gave away randomly during the auction chose to donate the gift cards to The Reading Tree, another delightful and large-hearted surprise. If you were unable to catch the auction action, you can review the complete seven hours of bidding banter in the 2009 #BAGG Auction Tweetscript. Final thanks to everyone who donated books, to those who bid, to the lucky auction winners, and to the individual donors–you all deserve a standing ovation. 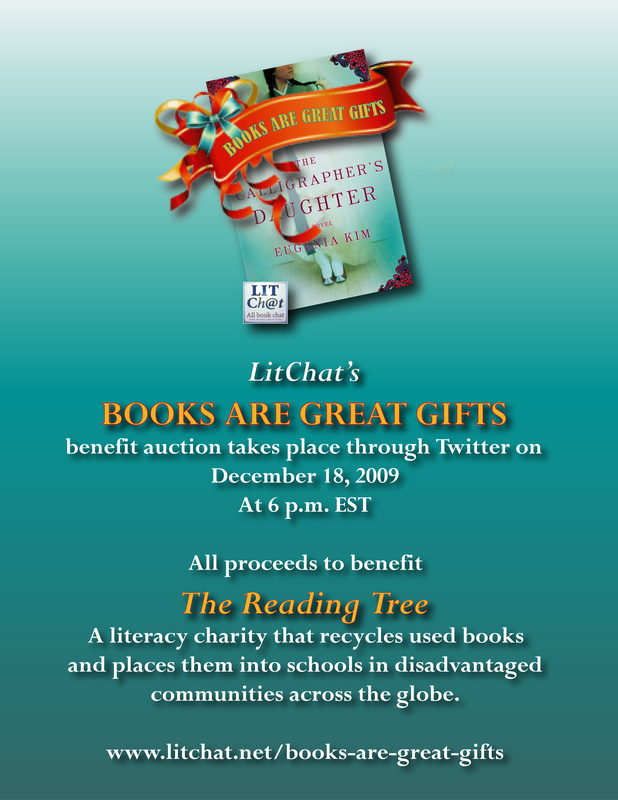 We are a dynamic community and together with literacy charities such as The Reading Tree, we can make a difference in the lives of children around the globe. On behalf of Reading Tree, please accept our sincere thanks – we are overwhelmed! We’ve never been the beneficiary of an effort so creative, nor have we met so many talented and clever people in one place. All of the money donated through the auction will be used to provide resource materials to teachers in Title I schools who receive our books for their classrooms. This will include articles on how to motivate reluctant readers, as well as materials for creating a “reading club” for their students. Again, thank you for your kindness and for a very fun experience!